Note For information about how to use a USB flash drive as a memory unit on your Xbox 360 console, see Using USB flash drives with Xbox 360. To troubleshoot USB flash drive issues, see Xbox 360 storage. The device isn't compatible with Xbox 360. The USB cable connection is incorrect or faulty. The Xbox 360 console didn't recognize the device during startup. The USB device requires an external power supply or is faulty. 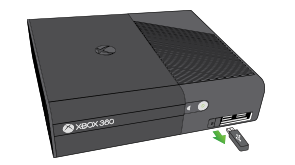 The over-current protection mechanism temporarily disabled the USB port on the Xbox 360 console. The USB port on the Xbox 360 console is faulty. To resolve issues with USB devices, try the following solutions. Note Test your USB device after each solution to see if the device works. If the first solution doesn't resolve the issue, go to the next. Check with the device manufacturer for compatibility with Xbox 360. Restart the Xbox 360 console. Disconnect the device from the USB port, and then turn off the console. After 5 to 10 seconds, turn the console back on. After the console has restarted, reconnect the device to the USB port. Turn off the console, remove the power cord from the power outlet, reconnect the power cord, and then turn on the console again. Disconnect any unnecessary devices from the console. Determine whether the USB device requires a separate power supply. If it does, attach the power supply. Connect the USB device to a different USB port on the console. If the device works in another USB port, the Xbox 360 console may need service. An over-current protection mechanism protects USB ports on the Xbox 360 to reduce the risk of damage. 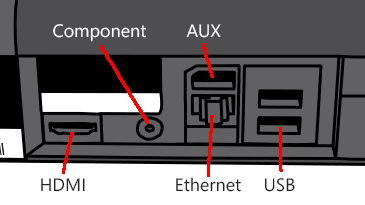 An over-current situation may occur if the USB device attached to the console tries to draw too much power from the USB port. In these situations, the USB port temporarily turns off to prevent damage. It then resets after the device is disconnected. Would you like to contact Support regarding the "USB device doesn't work when connected to an Xbox 360 console" issue you were reading about or a different issue?